How bout my flawless prediction for Duke/UNC yesterday?! 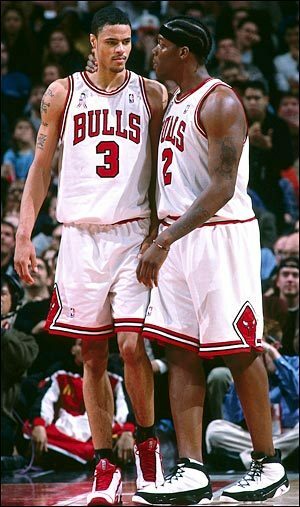 Can u imagine D-Rose & the Black Jesus on the pick-n-roll? IS AMARE REALLY THE ANSWER IN CHI-TOWN? When the rumors first circulated about Amare potentially paired with Derrick Rose, I jumped on the idea like I was Roller Girl & Marky Mark was chillin’ on the sofa. In my opinion, nobody in the NBA runs the pick-n-roll, pick-n-pop, or pick-n-dunk-on-ur-head better than Mr. Stoudemire, while his athleticism & experience running with the floppy-haired Canadian immediately raises D-Rose’s game another level. Only Greggy G can compare Amare to adult-star Nautica! As for the talk he cares about defense as much as Nautica Thorn cares about celibacy, first off, he’s not nearly as pedestrian as they say, and two, let’s not forget he was raised in Mike D’Antoni’s system where they never-EVER practiced defending the rock. In addition, before Shaq arrived he was forced to play out of position at center, and now with the aging-Diesel, he’s actually responsible for more in the paint then you think. Throw-in how desperate the Bulls are for some back-to-the-basket scoring to open things-up for their shooters, and this deal simply sounds like a slam-dunk for the Bullies…right? Unlike Paxson handling his tiny guards, Krystal seems confident in her decision on what to do with this tiny bikini! While Paxson is more than deserving of the criticism for the team’s lack of development, on the flipside, he does have more young pieces around him than T.T. Boy on the set of Teen Tryouts #27. But as the roundball experts spend their energy arguing about which youngsters should be included for the so-called Black Jesus, I content that aspect of the deal doesn’t really matter (give them anybody but Rose). What Pax must wrestle with…is it worth it to trade for the star-PF for a year & a half if they can’t or won’t re-sign him after next season. And don’t be fooled by the naysayers, if he stays healthy, he will command a max contract. Taking it a step further, even if the Bulls offer him the max deal, couldn’t you see the Florida-raised, Phoenix-played baller having no interest staying in the Windy City after a long winter? While you never know what to expect from youngsters with potential, Mr. Stoudemire is proven kick-azz commodity! As for what I believe GM Stevie “I f*cked this thing up pretty good” Kerr wants, considering the contracts have to come close to matching, his owner wants cap-relief next season, and their need to get younger, more athletic & better defensively, the deal seems blatantly obvious to me: Drew Gooden’s expiring 7M, the still oozing potential & suddenly productive skills of Tyrus Thomas, the underrated & unutilized skills of 6-7 SG Thabo Sefolosha, and the Bulls 1st round pick next season. And because hardly anybody else in the Association can match Mr. Kerr’s specific criteria to make the trade, if Amare’s really on the table, it’s up to GM Johnny Pax to place an order. If Steve Kerr was the GM of this, he'd probably think it would look better with a heavy sweatshirt and some baggy jeans! As for what the GM of Insideplays would do, it’s a no-brainer…take a chance for once and suit-up the Black Jesus at the United Center! Even if he walks after next season, winning is contagious and this is the best opportunity to let our youngsters experience it. Throw-in the added development of Rose’s game playing with this style of big, the swagger he brings that Vinny Del Scott Baio desperately needs, and a fan base yearning & deserving of some excitement, and I can’t see how Reinsdorf’s pseudo son doesn’t pull the trigger! ...is gonna have trouble handling the German Diggler? I do care that Shuttlesworth might be a late scratch tonight (thumb), but for a different reason than most. Considering Jason “6th man of the year & Mavs savior this season” Terry is out, I’m actually glad Ray-Ray will be pimped-out in a suit to keep this line nice-n-low. 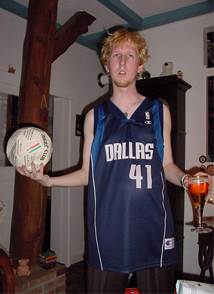 But the biggest reason I’m taking my hard earned dollars and rolling with Doc’s crew is the match-up between Dirk and KG. Of all the teams on the professional hardwood, nobody strikes fear in the German Diggler more than the lanky, athletic, and passionate defense from Mr. Garnett. 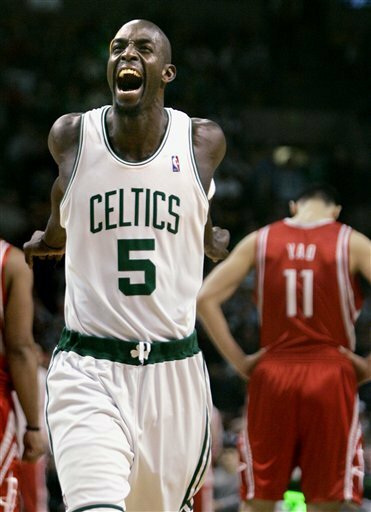 I have a feeling this is how KG's gonna treat Dirk! While Kelenna Azubuike has always been able to do this, now he's raining in everything from downtown as well! I’ve been riding the Warriors home-bandwagon of late and have no desire to jump off. Nellie’s fast-break crew has won three straight at home (Phoenix, Utah, NY) and averaging a ridiculous 127 ppg over that span. S-Jax is playing like an elite superstar of late (last 5 games: 29 ppg, 9 apg, 7 rpg), Kelenna Azubuike might be the most improved player in the NBA (14 ppg, 5 rpg, 47 3-pt%), Corey Maggette should easily overpower the Blazers SFs (20 ppg, 6 rpg, +8 FTA/gm), the combination of Jamal Crawford & Monte Ellis should run circles around starting PG Sergio Rodriguez, and surprisingly, Ronny Turiaf seems like a perfect fit in this system manning the middle with Biedrins out (last 5 games: 10 ppg, 6 rpg, 3 bpg, 57-fg%). The Blazers are gonna have more trouble than this leaf covering all the Warriors sweet assets! 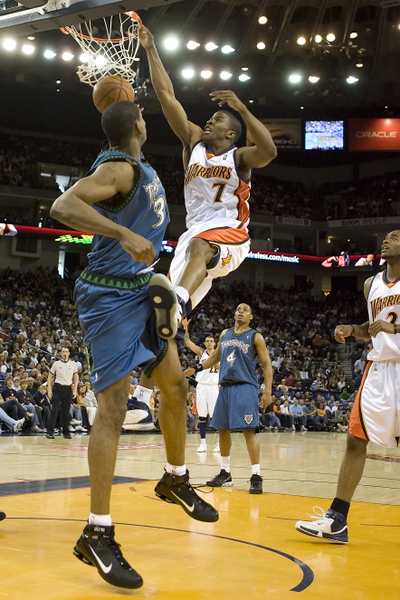 While Chrissy Quinn can handle this match-up, with Chalmers a little hobbled, how you think he'll match-up with Rose? TOUCH ME HERE for my Bulls/Heat Preview & more Lovely Ladies! Just like a "Lima A Day" pic is a no-brainer, investing on all the Thursday Night TNT contests is just as easy 4 me! While most believe D-Wade will be desperate to get Miami back on the track heading into the break, I believe the young Bulls will actually be the team showing the most adrenaline on TNT now that their finally playing well. And have you seen the roster surrounding Mr. Wade of late…the Matrix is simply waiting to be traded, some dude named Joel is playing 30 mpg in the middle, and The Bease has been yanked in-n-out of the line-up more than Greg Paulus at Duke the last few years. I have a feeling the Bulls staff will be all smiles when they look at Rose's potential match-ups tonight! I agree girl...BALL BEFORE ALL!!! This page contains a single article from February 12, 2009 10:57 AM. The previous days article was NBA Picks, Duke/UNC Preview, & Bikinis. The next days article was Friday Night Gambling Picks & Hotties.